It is not every day that I come across a scientific publication that so totally goes against my perception of what science is all about. Humlum et al., 2011 present a study in the journal Global and Planetary Change, claiming that most of the temperature changes that we have seen so far are due to natural cycles. 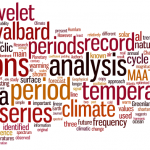 the observed late 20th century warming in Svalbard is not going to continue for the next 20–25 years. Instead the period of warming may be followed by variable, but generally not higher temperatures for at least the next 20–25 years. However, their claims of novelty are overblown, and their projection is demonstrably unsound. π = 3.14159 = 2.14159 + 1. Of course, π is a fundamentally meaningful number, but you can split up this number in infinite ways, as in the example above, and most of the different terms have no fundamental meaning. They are just numbers. But what does this have to do with climate? My interpretation of Daniel Bedford’s paper in Journal of Geography, is that such demonstrations may provide a useful teaching tool for climate science. He uses the phrase ‘agnotology’, which is “the study of how and why we do not know things”. NOTE: The hijacking and spread of misinformation and slander by certain commenters has led to the closing of further comments on this article. I am however, very thankful to those many who made good points, asked good questions and provided further references, thus contributing to better public education. Jim. Note: This is the first of two or more articles on the extensive tree mortality now being caused by bark beetles in western North America. The goal of this first post is simply to provide necessary background on the relevant biological/ecological processes involved, so that future articles discussing climatic and other possible influences, are more understandable. 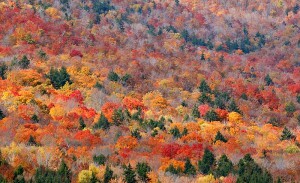 It’s mid autumn in the northern hemisphere, whose deciduous forests annually provide one of earth’s great spectacles. When deciduous trees prepare for their seasonal cold dormancy they partially recycle important elemental components of chlorophyll and the associated photosynthetic machinery, such as nitrogen, phosphorous and magnesium. Other more minor leaf pigments, which vary in abundance and spectral properties from species to species, are then temporarily exposed on the tree before leaf drop. The timing of the chlorophyll loss varies between trees, and when combined with the presence of evergreen conifers, gives the flamboyant array witnessed, typically heavy in the yellow to red pigments. If you’ve never seen it, consider putting it on your list of worthwhile things to do in your life, as did the guy from San Francisco I once met on the Appalachian Trail in Vermont. Never mind that he carried most of his gear in a plastic garbage bag slung over his shoulder and wondered why the bears were bothering him at night when he didn’t hang his food (mostly a large hunk of cheese in a paper bag). We were instantly friends when he told me he was on the trail just to see the colors, up close and personal for a few days, in response to a magazine article he’d read. In western North America, true deciduous forests are strictly riparian and therefore limited. The vast majority of upland forests and woodlands are dominated by conifers, all but one of which are evergreen. However, one highly important deciduous species—quaking aspen (Populus tremuloides), which turns brilliant yellow—forms groves that range in size from a few trees to vast forested expanses, typically on mid to high elevation mountain slopes with decent groundwater supply through the summer. [The largest known organism in the world is a large aspen stand in the West Elk Mountains of Colorado, USA (aspen is highly clonal, connected by rhizomes).] The greens and yellows provide a poor man’s version of fall color compared to an eastern hemlock-hardwood forest perhaps, but when combined with often colorful rock exposures, blue skies and rivers, and montane topography, the sight usually has its own magnificence. Red foliage however, is one thing you’re not supposed to see a lot of in western North America, any time of year. In many places in the west–particularly through the central and northern Rocky Mountains and British Columbia–there is now a lot of red foliage, but unfortunately, it’s not just in autumn, and is occurring on non-deciduous species. The proximate causes of this are (1) Dendroctonus spp. (literally, “tree killer”), the most destructive of several destructive bark beetle genera, and (2) tree physiological stress. God’s “inordinate fondness for beetles”*, combined with certain human activities, is now causing some serious problems indeed. 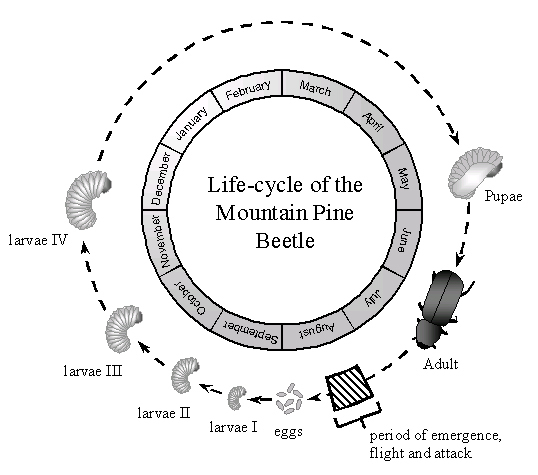 Here I’ll try to give background on the issues related to bark beetle outbreaks, working from proximate to ultimate causes, and focusing on the one beetle species currently doing by far the most damage, the mountain pine beetle (MPB), Dendroctonus ponderosae. The MPB is attacking a set of highly important pine species (Pinus spp.) over a very large area of western North America, especially lodgepole pine (Pinus contorta), ponderosa pine (Pinus ponderosa) and whitebark pine (Pinus albicaulis), but also some of the other five needle pines (esp. limber pine). Other species of beetles in the genera Dendroctonus and Ips are also doing some serious damage to these and other species, albeit at smaller spatial scales and/or less intensively, and represent so many variations on the theme illustrated by the MPB. Theological considerations aside, there are many hundreds of species of bark beetles worldwide, and the Curculionidae, or weevil family, of which bark beetles are a member, contains the largest number of species of any animal family. However, only a very small percentage of “aggressive” bark beetle species has the potential to cause extensive tree death during population outbreaks (“irruptions”). These species kill by overwhelming, with coordinated aggression and sheer numbers, a tree’s defenses, followed by a complete destruction of the tree’s ability to transport the products of photosynthesis (e.g. sucrose, amino acids, hormones, etc.) through its transport tissue, the phloem or inner bark. This is usually accompanied by an impaired ability to transport water to the leaves via the outer xylem (the sapwood), courtesy of blue stain fungi (e.g. Grosmannia or Ceratocystis spp.) carried and introduced by the beetles. As ecological systems go it’s very well studied, and contains the interesting wrinkles, non-linearities and feedbacks so typical of ecological systems, even relatively simple ones like this. Plant physiology and demography, insect population dynamics, insect-fungal symbioses, land management practices, and climate dynamics all play important roles in the overall outbreak process. 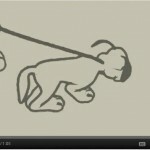 Simplistic explanations of the causes of these dynamics are, as usual, to be avoided. Whether or not an individual tree will survive a beetle attack is determined by its pre-attack nutritional and hydration states, and the number and timing of beetles that attack it. Conifers defend themselves with both pre-existing (“constitutive”) and de-novo (inducible) defense systems. In pines, resins–a large class of complex plant chemicals that function as antimicrobials, fungicides and insect toxins –are delivered primarily via a constitutive production/delivery system consisting of resin canals lined with resin-producing epithelial cells. Resins typically have strong and interesting odors (familiar to many in products like turpentine, a commercial resin derivative), and they cause the distinctive smell of a pine forest in the summer when they vaporize from leaves and bark. They are produced and delivered in solution, flowing through the ramifying canals in the outer sapwood (the mostly live, water conducting part of the wood) and phloem, which exist solely for that purpose. These solutions are typically highly viscous and sticky, not unlike the consistency of molasses or honey. Adult mountain pine beetle, about 6 mm long. Beetles attack by chewing straight through the outer bark into the phloem. If they sever a resin canal of a healthy, hydrated tree, there is an immediate and forceful flow of resin solution under hydrostatic pressure that often kills the beetle. This action represents a cost to the tree however, in both water and resin, the latter being metabolically highly expensive material. If the tree’s carbon balance has been suffering and/or the tree is not well hydrated–due to things such as drought stress, an extended beetle attack or low light levels–its ability to maintain resin solution pressure and/or chemical toxicity, is accordingly reduced. Inducible defenses are also important and involve gene activated cell death and a subsequent “walling off” of living cells/tissues via induced biochemical processes, to slow the beetles’ and fungus’ physical progress in the tree. Although many beetles will thus typically be killed or isolated during an attack, even a perfectly healthy tree can eventually have its defenses overcome by sheer beetle numbers. These trees then become breeding grounds for a repeat of the process on other, nearby trees. 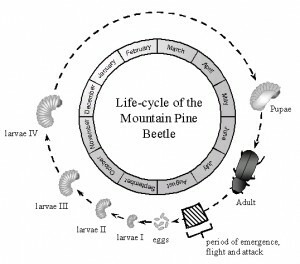 This leads directly to issues in beetle population dynamics, which are arguably the most critical element in the system’s dynamics. Bark beetle population growth potential depends on forest structure and composition, tree vigor, and weather/climate. A key reason for the destructive potential of aggressive species like the MPB is plasticity in the number of generations produced per year, which correlates well with mean annual temperature. There are (at least) two direct temperature effects (and likely several other indirect ones) on beetle population processes. In the warm season, warmer temperatures accelerate development through several larval stages and pupation, and in the cold season they can reduce the kill of over-wintering larvae. In the MPB, two (or more) generations can be produced per year in warmer climates (“multivoltine” reproduction) while only one half generation per year may occur in more northerly or higher elevation populations. 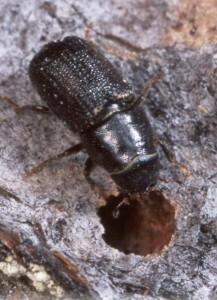 For equivalent food supply and fecundity rates, this variability in generation time will obviously have a very strong effect on the number of adult beetles emerging per unit time to attack new host trees (although the thermal requirements for the full developmental cycle can mitigate this somewhat). As a generalization, winter temperature controls are relatively more important in colder climates than in warm ones, so the thermal controls on population growth will vary with geography and physiography. Also, generation time has important implications for the potential rate of evolutionary adaptation to changing growth constraints (such as host defenses or climatic tolerances), via the total possible number of genetic recombination chances per unit time. Plants and their insect herbivores have been involved in this evolutionary battle for tens of millions of years, and have developed some fascinating defense and attack mechanisms in the process. It’s not at all easy being green. Because a tree can recover from some limited number of beetle attacks–by restoring its carbon balance and/or hydration over time–aggressive species like the MPB do not allow this to happen. They do so by emerging from trees within a narrow window of time, roughly 2-3 weeks (also temperature dependent) and then coordinating their attacks using chemical communication (i.e. pheromones). 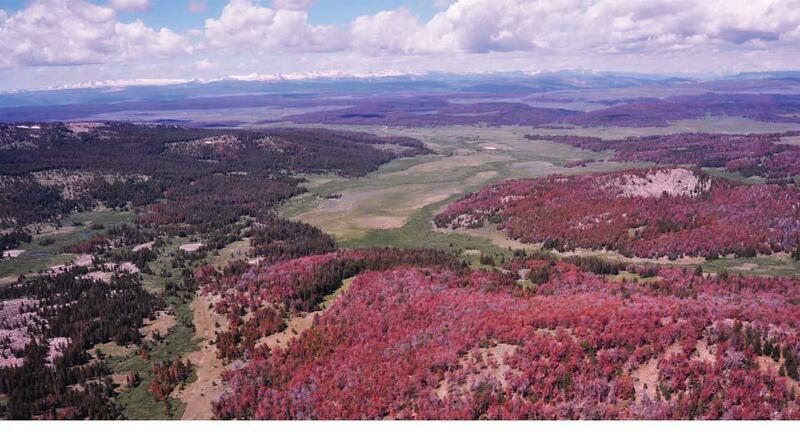 For the MPB in southeast Wyoming’s Snowy Range for example, where there is currently one generation per year, emergence from lodgepole pine is typically in high summer (late July to early August) when trees are feeling the effects of summer water stress. The pheromones released by inititial colonizers signal to newly emerging beetles in flight that an attack is underway, drawing a critical mass of beetles into a coordinated attack on certain trees exceeding a minimum basal diameter. (Beetles reproduce far more effectively in larger trees and near the tree base, because the phloem food source is thicker there.) This creates an attack that would otherwise be far more diffuse and less effective, were beetles to just land randomly on potential hosts. Once tree defenses have been overwhelmed and the tree is certain to die, other pheromones are then produced which drive in-flight beetles away, thereby maximizing the food resource for the colonizing beetles and their coming offspring. A tree under attack, with vigorous defense of resin exudate from entrance holes. This tree will not likely survive. Tree physiological stress also plays a critical, climate-dependent role, especially in getting an outbreak started. A central tradeoff in all vascular plants is the unavoidable loss of water for a given gain of carbon dioxide, since both exchanges occur via stomatal pores on leaf surfaces. When plant water status drops below minimum levels required for cell functioning, stomates quickly close and carbon fixation thus stops. When light levels are low, carbon fixation also slows (albeit for different biochemical reasons). High tree densities can thus limit per-tree water and/or light availability, leading to lowered photosynthesis and consequent carbon balance problems that directly affect trees’ abilities to defend themselves from predation. 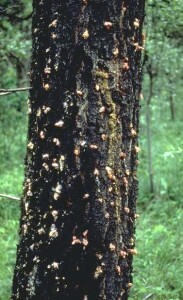 An MPB population can very quickly irrupt in, and destroy, a stand of physiologically weakened trees. Healthy forest stands and landscapes, and mixed species and/or mixed size forests, stand a much better chance of at least slowing an outbreak down, especially at as the spatial scale increases. However, even then, large forested areas can eventually be overwhelmed by sheer beetle numbers, as is now happening in many places. Much of western North America has elevated tree densities, relative to pre-settlement times, either for all trees, the largest tree classes thereof, or both. This is primarily due to active fire reduction/suppression policies over the last century or more by federal and state land managers, and/or timber harvesting practices. The resulting increased competition, without any increased climate stresses, would by itself increase tree physiological stress and affect beetle outbreak dynamics. The addition of warmer and/or dryer conditions simply magnifies this problem. Similarly, increased climatic stress unaccompanied by increased competition would also favor the beetles. 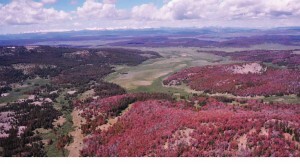 Because natural fire regimes varied widely historically, and are complicated in many places by similar variability in logging practices and intensities, the effect of fire reductions on bark beetle outbreaks varies considerably and involves several issues of spatial and temporal scale variability. This makes the topic both interesting and difficult, and requires good information on past land management practices and forest stand dynamics. That topic however is fodder for another post. Raffa, K.F. 1988. 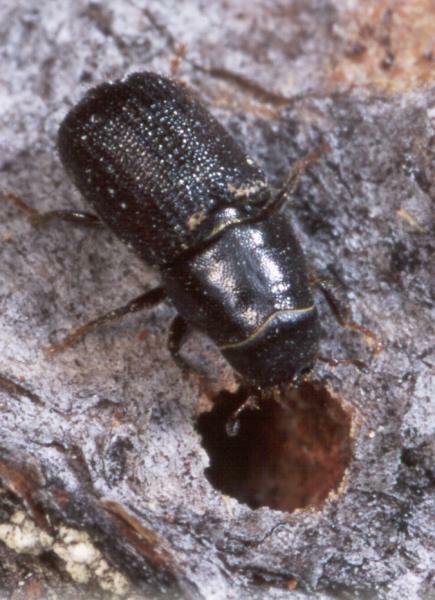 The mountain pine beetle in western North America, pp. 505-530 in: Dynamics of Forest Insect Populations., A.A. Berryman ed. Plenum Press, New York. Are the CRU data “suspect”? An objective assessment. Recently we received a request for setting up a glossary-only search mechanism, or perhaps one web page with a long list of glossary entries with hot links to full explanations. The glossary that we already have is a good start, but we are all busy and it’s hard to find the time for extending this. But there are also a number of external web pages which provide climate-related glossaries, such as the NOAA (they also have a seperate page for paleo-stuff), the Bureau of Meteorology (Australia, and there is even one by the Australian EPA), the Environmental Protection Agency (EPA, the U.S.), and the Western Regional Climate Center (WRCC, the U.S.). Wikipedia also has a glossary for climatological terms. For those who seek the explanation for more bureaucratic terms, both the EU and the UNFCCC provide glossaries that may be useful. Furthermore, there are some nice resources available, such as the Encyclopedia of Earth.